Technical analysis, or charting, is the study of past price and volume movements with the aim of identifying future price movements. A technical analyst assumes that all relevant information about a given security is already priced in by the market, and that a study of past patterns can reveal both market sentiment and intention. There are a wide variety of methodologies, but most rely on the use of a variety of mathematical indicators which attempt to gauge qualities such as momentum, support, resistance and trend. Unlike fundamental analysis, little attention is given to financial metrics or business performance, and the methodologies are typically better suited to shorter time frames. Because the two key variables of price and volume can be obtained from any traded security, technical analysis is an extremely versatile technique that can be applied to a wide variety of markets. 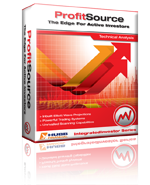 When it comes to technical analysis, there is no better tool available than ProfitSource software. Take the ProfitSource Tour.